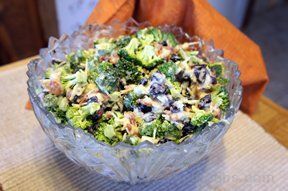 A scrumptious broccoli salad that is made with a number of ingredients that add flavor and texture. Topped off with a light coating of a sweet homemade dressing, this salad is a perfect side for any holiday meal or special occasion. 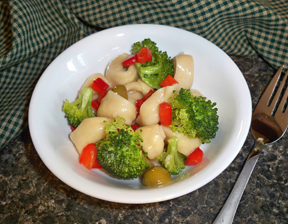 Prepare the ingredients as necessary; combine all the ingredients together in a large bowl; toss to mix evenly. Prepare the dressing and add just before serving. Stir until evenly coated. Note: you may not have to use all the dressing. Add until you feel the salad is coated to your liking. "Yum! I loved this salad. 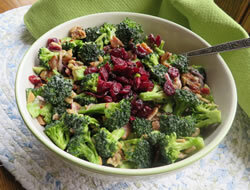 The bacon and dried cranberries added great flavor and texture. 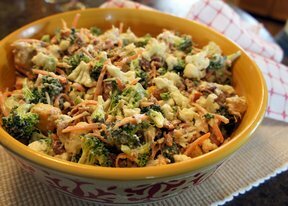 The sweet dressing was just right for the mixture of flavors. I think I will make this for Easter."